This week: Macy's has already replaced 1.1 million incandescents, SAS to be first customer for HelioJet's LED lighting system, and Emberlight throws dimming wide open. A Kickstarter campaign has been launched to support an interesting dark horse in the home automation space. 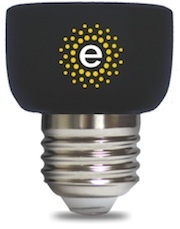 Emberlight is a male/female E26 socket with wireless electronics that claims to be able to dim any dimmable bulb -- LED, incandescent, or CFL. With 41 days to go, the project is 82% of the way to its goal of $50,000. It looks as if you simply have to tell the first Emberlight on a network the name of the WiFi access point and its password. This bulb then acts as a master (standing in for a separate hub) and further communicates with other Emberlight bulbs via Bluetooth Low Energy. Not every Emberlight has the WiFi master functionality; a master unit will ship with each order. The developers seem to have decided to keep pricing simple by not distinguishing the hub Emberlight from the others by price. The project claims that lights can be controlled by proximity to your smartphone. It sounds as if there should be a Bluetooth pairing operation somewhere in the picture, but it is not spelled out. The Emberlight can be had for $49 apiece during the Kickstarter program, or $40 each for 10 of them. Some outlets report that the price will be $69 when it is released to the wider public. Those prices are in the range of existing controllable light bulbs such as Hue and Connected by TCP -- but the Emberlight can be used with any existing (dimmable) bulb. It remains very much to be seen how the device handles dimming various LED bulbs. I have seen significant differences in behavior among Philips SlimStyle, Cree, and TCP bulbs with existing dimmers. Will some LED bulbs buzz, flicker, or cut out early when controlled by the Emberlight? The answer to that quesiton could determine its success or failure. The US Department of Energy has released a new CALiPER snapshot report on outdoor area lighting. It surveys the products in the LED Lighting Facts program, more than 19,000 in number now, and looks at some of their characteristics over time since Lighting Facts began in 2009. A notable trend has been the descending color temperature of area/roadway, canopy, and parking garage luminaires, as shown in the figure. For example, between Q3 2009 and Q2 2014, the CCT of listed area/roadway luminaires dropped from 5,318K to 4,568K. We have noted how street lights in particular have often proven unpopular in direct proportion to their CCT. And as more studies link light with elevated blue content with undesirable effects in humans, wildlife, and the environment, the industry does seem to be getting the hint. Select stores and distribution centers in states such as, California, Connecticut, New York, and Massachusetts will be remodeled with solar power energy roofs in 2014 and 2015. Macy's plans to install 20 additional solar energy systems on-top of 55 already implemented at Macy's and Bloomingdale locations. HelioJet of New York has been working with glass specialist Schott and Lufthansa Technik to develop LED strip lighting capable of both white and colors, and which will hold its color point for years. The result is HelioJet SpectrumCC (Color Control) with True Color Sensor, allowing "each and every LED installed in the system [to render] colors in a perfectly balanced and homogeneous manner and [to emit] precisely the right color shade throughout its entire service life," according to the company's press release. Scandanavian Airlines will deploy the lighting on nine of its A330 and A340 jets by the end of this year, and they will fly in 2015.